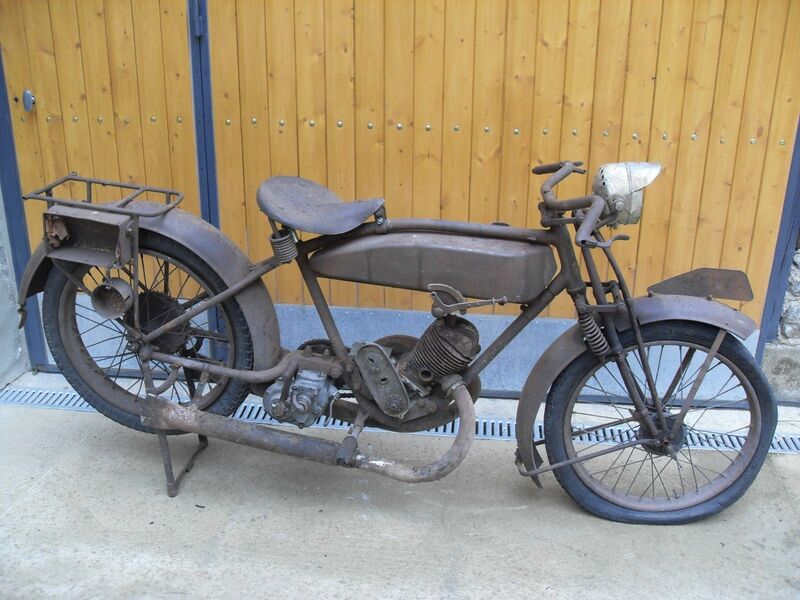 Hi All, just went mad and bought what I believe is a 1926 Magnat Debon 250. I know nothing about these so am wondering if anyone out there has something similar or some experience with these beasties? It's been sitting in a French barn for many years and is about 80% complete, fortunately although very rusty the frame and all the tin ware is sound. Hopefully I can touch base with someone with some knowledge please?? At least with a little Froggie this early the same tin-smithing, mechanicing etc skills are needed as if you'd bought a similar thing from a barn in Norfolk, Devon or wherever. I bet vieux Jean-Paul had his franc's worth out of it before it was abandoned in that barn, so expect parts to be knackered beyond belief and totally unobtainable. on your own with this one Bodger. Doom and gloom fellas, let's have some positive vibes here! I've got to say the look of this thing (and potential finished look) make it worth while to give it a go. Although I've wanted a flat tanker for a long time, I have to justify my bikes to myself, and her indoors. I don't have the dosh or the room for ornaments, I own it, I ride it. So my desire for a flat tanker has always been off set by how much it would get used compared to the buying cost and valuable room it will take up. Second, find a French specialist forum and join it, they will be your best friends. Thirdly, I have found the Terrot MT1 I have just (nearly ) finished was very well made, simple, but not crude, so not ALL of it will be 'nackerd'. Fourthly, it will be great fun. You will not be able to spend hundreds of ££££ or Euros on bits as there will be non to buy unless you are lucky. Scour ebay.fr every day. Fifth, don't get too hung up on originality. The bikes are not worth a fortune, are not collected by geeks, so re-build it to work and be safe and be different. I adapted BSA Bantam levers to my original handlebars, universal cable kits for controls etc. Fighting it all out will be the fun bit! Finally, start and maintain a running thread on here so we can all chip-in at times. Good advice. And if your not worried about originality look at some of the bits being made in India and how cheap they are. Be warned, you get about what you pay for (and a lot are post free) but they will be fine for an occasionally used bike and a lot come painted for the same price. Google Enfield county or classic enfield as they make a lot of stuff that will fit other bikes. Good luck with the project and some photos please. Magnat Debon and Terrot are much the same thing, bit like ajs/matchless so you might get some help from the Terrot lot in France. I have given up trying to help out anyone who has imported one of these french wrecks not because I don't like them, I have had around a half dozen so am well aware of the drawbacks. What I have found is that an offer of books/magazines/handbooks meets with silence when the matter of price is brought up, or the poster gets the hump and goes off offended when the obvious is pointed out to them. If you look through the thread re french bikes on here I have several times given addresses of reliable parts suppliers in france of whom most speak english, However don't ask for manuals parts lists in english they don't exist, not ever. Lastly, give some of us old gits a bit of slack, I hate things like,"touch base" "source" "vibes" "cool" and any americanism applied to motorcycle parts, turns me right off a post. So, genuinely I wish you Good luck. I know you could have bought the same bike cheaper and more complete in France. In fact all the french bikes I ever had ended up being sent back to France, no market for them here. Did you buy yours from one of those opportunistic antique dealers who bring them back by the vanload? No, he bought his from the hopeful bloke who bought it from the dreamer bloke who swapped it with the "I love a bit of French Art Deco" bloke who bought it from the French bloke at Kempton who made a killing from all those unsold bikes his mate had in a barn in Provence. Only joking...I had a Monet Goyon some years back and the best day was when I did a deal with the Dutch pig farmer who took it away and gave me an Empire Star in return. You and I are justifiably cynical Rex, but I get really angry about all this crap being shipped over from France. It will do the old bike movement a lot of harm in the end. The French are selling this stuff because due to their draconian Bureaucracy and the virtual impossibility of registering a bike without documentation now it is just scrap or spare parts. Even restored and registered stuff over there has limitations of use applied to them. I can assure people here that the French will not sell anything half decent to us as they view it as their heritage. 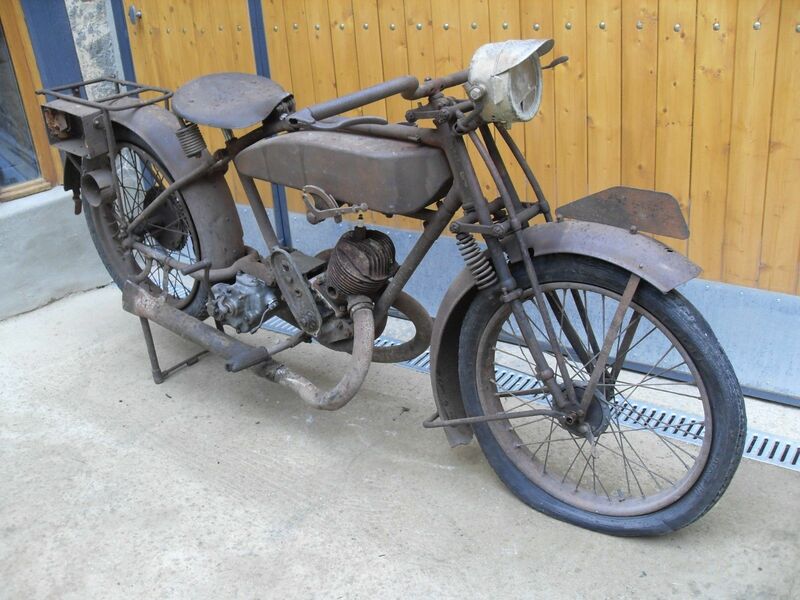 Let's face it, to them we are awash with old bikes, all theirs went to the scrap bin in 1940-44, possibly as reinforcement to the Atlantic wall. They have very little in the way of bigger bikes after 1945, just lots of tiddlers due to the then govt being very anti motorcycle. The antiques trade is in the doldrums, so making a pile of cash out of mugs who buy half a scrap 2 stroke off ebay or at Kempton is a bonus. 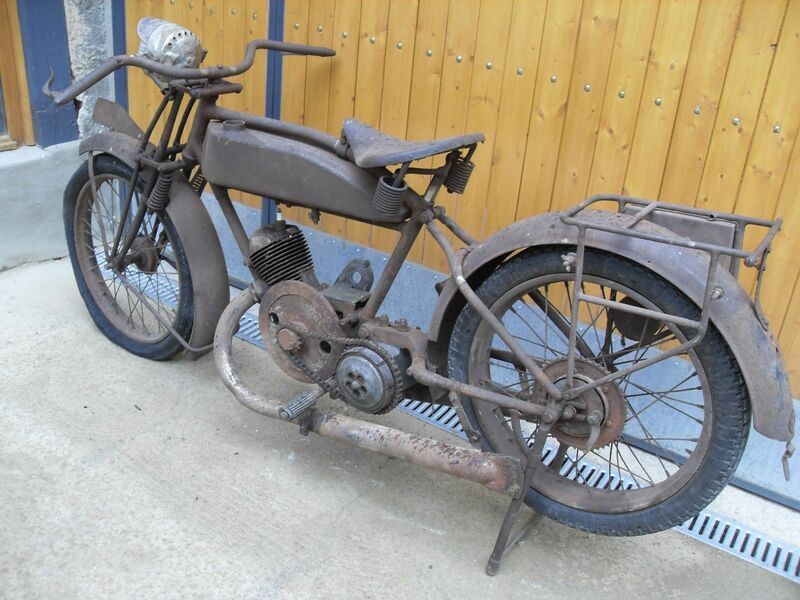 I regularly see on ebay french bikes being sold as far older than they are, or badly misdescribed or bless them, hardtail chopper bobber projects. You can still buy a small flat tanker for around 4/5k still, a better 'investment' as you'll likely get your money back. I am not anti french bikes just pragmatic; I have had a Terrot HST, a couple of 1950s Motobecanes 175 among others not badly made, quite good looking, but a real pain to restore but it gave me an excuse for lots of trips over to France for the weekend. Damn me, I even had a 450cc FN with the rubber suspension. Hey guys lighten up a little? I do this for fun, not for political correctness or financial gain. I don't quite understand how any bike imported from any county can do any harm to anything?? I'm not the greatest fan of Harley's but don't get embarrassed when I'm out with friends who ride them. Like wise they don't shy away from me with embarrassment when I'm on one of my scooters. Sure we take the piss out of each other but we're still friends and still ride together. Oh I guess I should mention before political correctness bans me from mentioning scooters on a classic bike forum, I ride them because the arthritis in my left hand allows me only limited clutch operating time, since I ride two wheels 7 days a week all year round I needed something to give my hand a break. Got to say though............ I like them if I need to get somewhere rather than being just out for a ride. I bought the bike from a guy bringing them over en-mass, since I don't speak a word of French this was (for me) the easiest route. But I had no intention to buy a French bike, German bike, Eskimo bike or whatever, I was just looking for a bit of fun. I do my own casting, welding, machining, sandblasting, plating, painting, powder coating etc. so re-build costs tend to be pretty low. I'm aiming to have this on the road for between £1500-£1800 which includes the purchase price. By my reckoning that ain't too much for a 1926 bit of fun? Thank you to all those offering advice and encouragement, I haven't taken any pictures so far but will try to post the ones from the eBay listing. As I progress I'll try to keep this thread updated with more photos etc. Had fun the last couple of days trying to get the fork link pins out, this has no bushes in the forks with the pins running directly in the castings, or in my case rusted firmly in the castings. A good soak in hydrachloric acid shifted all the surface rust but didn't penetrate at all, an overnight soak with penetrating oil then a generous application of heat didn't help either. So have resorted to drilling them out which has gone well, a rummage in the "stock pile" (also know as junk corner) has produced some suitable "stock" to turn the new pins up from. I have had to order a suitable sized reamer to ream the castings out back to clean before I can make the pins to suit. I was more concerned with sorting the forks than any other aspect of the bike as I figured parts would be scarce (confirmed by your good selves) if anything broke, but happy days they'll be fine. My Terrot was bought from a local motorcycle dealer who dabbles with old bikes every now and then and I wanted a difficult restoration. I retired early in life, and these bikes keep my hands dirty etc with DIY being my first course of action. 3 years ago I did a Lambretta TV175, sold in 20 minutes, followed by a 1975 Honda CB175, again sold unseen. These were easy restorations, DIY and spend a lot on parts from web sites on parts that are weak quality. 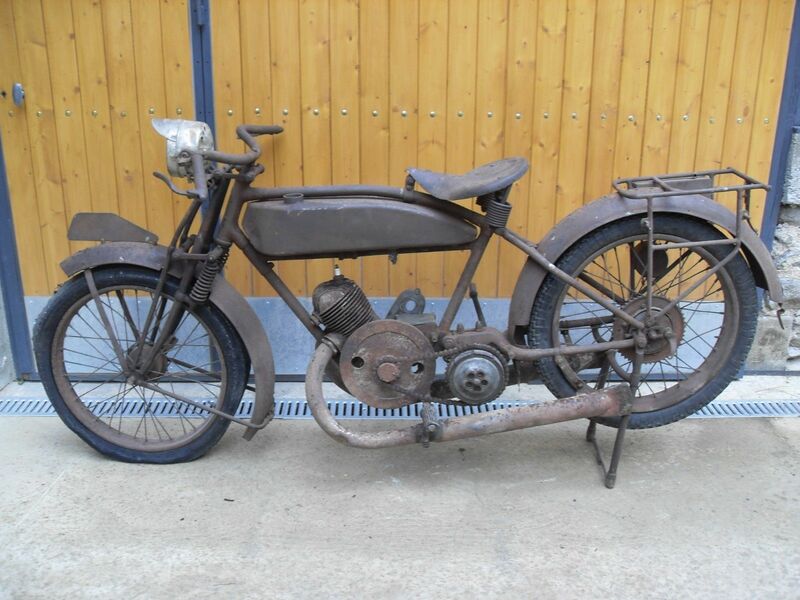 The Terrot will go up for sale very soon, a French Peugeot BIMA 1952 is next, bought from a French antique dealer from the back of her transit in Dover! The Bima will be an oily rag job and will be my last 2 stroke! Keep going, I look forward to reading about your challenges ad progress. isn't that exactly the point I was making re why it was not a good idea? brought over en mass using the uk market to make a fast few quid off those who have no idea why they are being dumped onto the uk market. don't talk BS about scooters, I'm 70, my daily ride is a twist and go Piaggio, reliable, cheap to run and more practical than one of the vintage bikes out the shed for every day use, and I won't get upset if its damaged by dumb car drivers while parked. The missing casings I can cast myself, the stub for the carb is broken so a brazing job after turning a new stub. I'll use a pre-mono Amal rather than source an original carb as jets etc. are readily available. Primary sprockets are good so just need a new chain. Drive chain and sprockets will be made up from blanks using common English sizes. I'll cast a replica magneto housing and have two options here, one is to use an electronic ignition from model aircraft engines, someone gave me one to play with and they're really simple to fit and have an electronic advance curve. However with no battery charging it would be a total loss battery ignition. The second option would be to make my replica housing to take a strimmer /chainsaw coil and rotor and chain drive it like the original. Both these options would cost me nothing as I have them already so are where I'll start just to get the bike on the road. I don't intend to sell the bike on so somewhere down the line I might find the original mag, but for now the object of the exercise is to get it going cheap cheap cheap!